This month, SURFACE 1°22 was invited by the City of Wagga Wagga to design and install a series of three artworks in the Sister City Walkway as part of its 2017 public art program. This site specific public artwork celebrates Wagga Wagga’s special relationship with its three sister cities – Kunming 24 ° N 102 ° E (China), Leavenworth 39 ° N 94 ° W (USA) and Nordlingen 48 ° N 10 ° E (Germany). Designer Emily Wills drew inspiration for the wallpaper style artworks from the City of Wagga Wagga’s civic collection of cultural artefacts and travel memorabilia from the Sister City Committee members. Fusing visual communication with her fascination of the applied arts, Emily enhanced a public space through ornamentation and decoration. The Sister City Walkway, wrapped in colour and pattern, celebrates spaces, places and cultural exchange. 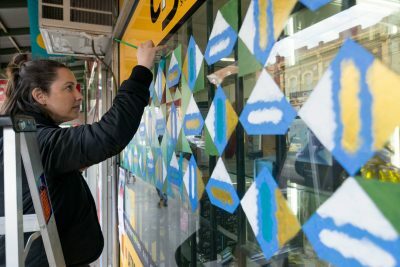 Emily shared her art making and design process in a special Paper Pattern Print workshop on 24 June, where participants from the Wagga Wagga community designed their own wallpaper designs using low-fi tablet technology. We loved this project. 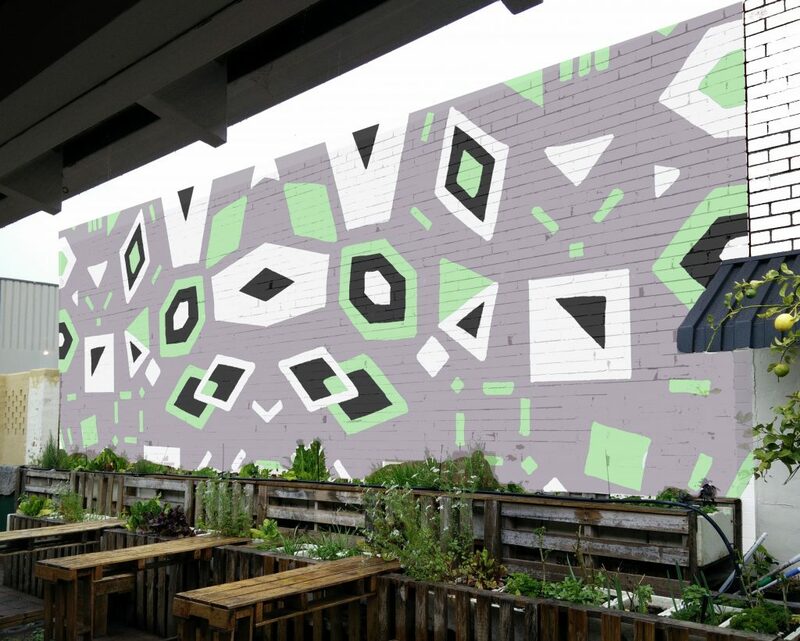 May it be the start of many more public wallpaperings and community art projects. Special thanks to Tracie Miller (City of Wagga Wagga), Kelly (Littlewood Signs), Chad O’Brien (Backyard Creatives) and our mate Elizabeth Robinson who helped make it happen. I love ornamentation and decoration. I believe there’s a rebirth in the Arts and Crafts movement, but with added geometricity. I want to make spaces, surfaces and objects interesting. I want to enhance the environment, and create enjoyable sensory perception. Put on a pair of pattern-coloured glasses to unconsciously influence people through design. Change and influence mood through decorative environments. I’m trained as a printed textile designer, but I’m ready to get these patterns on a variety of surfaces. Walls. Let me on your walls. Paint. Wallpaper. Vinyl decal. Our first proposal was to Mono Store in Busselton, Western Australia. Next…? Let’s see where this goes.